6 Bedroom Semi Detached House For Sale in London for Guide Price £2,500,000. Hamptons have been instructed by Max Fordham OBE, British designer, engineer and pioneer of sustainable design and environmentally friendly engineering to sell his primary residence, a family home for several generations. The house requires updating but the staples of the home are desirable. 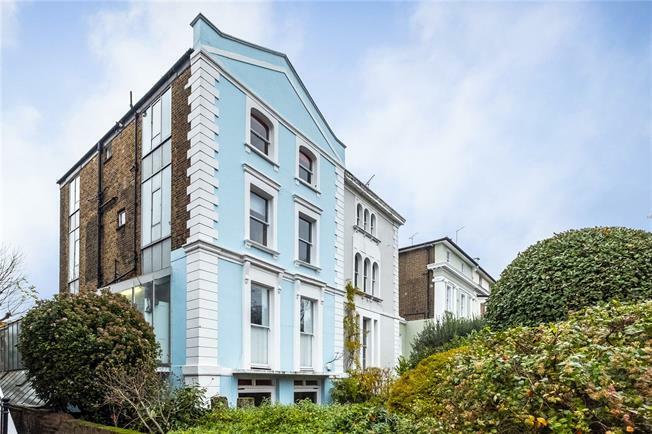 An imposing semi detached frontage, the east to west orientation, four floors, six bedrooms, four reception rooms, four bathrooms, period features, high ceilings, lateral space and over 3,500 sq ft mean the space can be designed to create a bespoke and contemporary family home. Subject to the required consents and permissions Hamptons in collaboration with ROAR Architects have drawn up plans to show the potential of the space to any prospective buyer. Features of these plans include an open plan entertaining area on the ground floor, small rear extension, side annex to be used as utility area/nanny or guest room and five bedrooms to include a top floor master suite complete with walk in wardrobe an en suite bathroom. Camden Square is a much sought after Garden Square with notable links to historic and celebrity figures to include Amy Winehouse and Orlando Jewitt. Located within 0.4 miles of Camden Road Station, 0.8 miles of Camden Town Underground station and 0.9 miles of Kentish Town Underground station transport links are convenient. The former Pickford Stables, now more notably recognised as Camden Market and Camden Lock, are less than 1 mile away.